Diving in Fiji is incredible. Warm, clear water, great visibility, myriad colourful fish and coral. Simply the best. The best diving is between April and October but from June to August the water cools significantly and full 3mm wetsuits are recommended. Costs of dives vary from F$65 to F$130. Every dive in Fiji will be different but equally rewarding and pleasurable, not just the dive itself but before and after as well. You are with friendly, professional people who make sure you get the best from your dive. If you have a certificate, plan to dive in Fiji. If you aren't certified, you can hop in the pool at your resort for a free trial. If you like it, you can take the introductory dive. Most resorts/hotels offer dive experiences. Near Savu Savu experienced and first timers can dive from Jean Michel Cousteau Resort. The beach slopes to the ocean floor with scattered coral heads and a sandy bottom. There's Mystery Reef with large, hard corals sloping to a garden of soft corals - lots of brommies (coral heads). On the outside reefs you'll find huge sea fans and soft, coral gardens. At Fan Fair there are coral crommies covered with sea fans and swim-throughs with marine life hiding in nooks and crannies. Dream House has big, friendly fish including batfish schools. Big Blue is a drop-off with gigantic gorgonians covered in feather stars. On the north side of Vanua Levu, just 30 minutes from the Great Sea Reef, is the third largest barrier reef in the world. Fish Wall is the home to a myriad of pelagics and sharks, while from June to December the area is host to large numbers of manta rays. 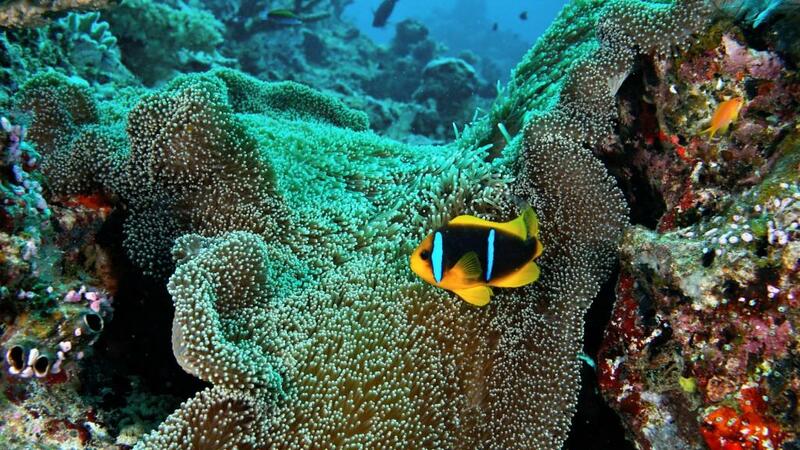 The nearby island of Taveuni is on the Somosomo Strait and is the soft coral capital of the world. You will find there are currents as this is what produces soft coral. Rainbow Reef is a very pretty garden. The Great White Wall is legendary - one of the most sought after dives on earth. On out-going tides The Zoo has barracuda, reef sharks and eagle and manta rays. Annie's Brommie is a beautiful coral head and nearby The Corner has an abundance of fish. Taveuni Island Resort is a great place to stay with its own 40ft catamaran that takes guests daily for two relaxed dives separated by a beach lunch and snorkelling. Vatulele has a drift dive on The Blue Wall, multi-coloured hard coral at The Aquarium and Outer Limits is another wall with a ledge that if often home to stingrays. Nearby Beqa Lagoon has 17 miles of mazes, tunnels and wonder. In the Mamanucas and Yasawas there's diving for all tastes. On the Malolo Barrier Reef is the world famous Supermarket (shark encounters), spectacular Gotham City (named after the resident batfish) which is home to stahorn and elkhorn coral and curious moray eels. Big W offers big fish action with mantas and sharks. The PADI operation from Castaway Island is Fiji's only resort-owned dive centre. They also do night dives and 'family' dives. On these trips, while the parent(s) dive, children also go out on the boat and learn to snorkel or kick around on the spyboats.